Seems like a good price for a Li-Ion 18v Drill Driver. Please note: No hammer action. 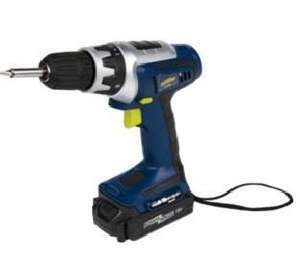 Challenge Xtreme 18V Cordless Drill Driver. •3 to 5hrs charging time. •Drilling capacity for wood 18mm and steel 8mm. •Temperature overload function which shuts down unit automatically if it overheats. •Accessories included: 2x double ended screw driver bits. •Double ended screw bit included. Sorry. Forgot to add that this can be purchased from Argos. Cant see no mention on argos that its Li-Ion. You're right. I zoomed in on the photo. The battery states 'LITHIUM POWER 18V'. The battery also looks half the size of Ni-Cad batteries of the same voltage. From this I believe its a Li-Ion battery. Hopefully the photo is correct. I have reserved mine for collection tomorrow so will find out for sure then. Just picked mine up and I can confirm that the battery is a 1.3Ah Li-Ion battery. The weight is actually 1.32Kg (with battery) so lighter than that stated. Is this better than 14.4V one from Aldi ?